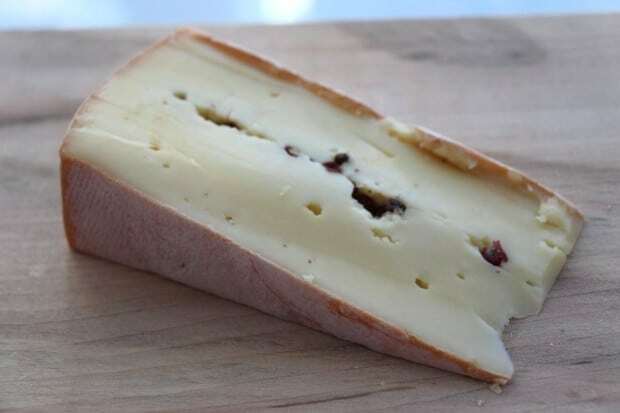 I first sampled Raclette de Compton au Poivre during a tasting for the 2013 Canadian Cheese Grand Prix where it was awarded top prize under the Flavoured Cheese with Added Particular Solids and Flavourings Category. The cheese is produced just outside Sherbrooke Quebec by Fromagerie La Station. Their 163 hectare farm includes 50 Holstein dairy cows which are raised organically on fresh grass, clover, asparagus and alfalfa. The La Raclette de Compoton is a semi-soft farm cheese made with certified organic cow’s milk. Aged for 120 to 150 days, it has a golden, ivory interior with a copper-coloured washed rind. Featuring a melt in your mouth texture and buttery, hazelnut flavour. This raclette is most unique as the centre of each wheel is dotted with pink peppercorns which add a nice crunch and zing.